Fem//me is an independent pop-up exhibition showcasing the work of emerging female artists in New Haven. Curated by Selby Nimrod and Hannah Plotke, the assembled works address and subvert female gender constructs and gendered notions of craft. 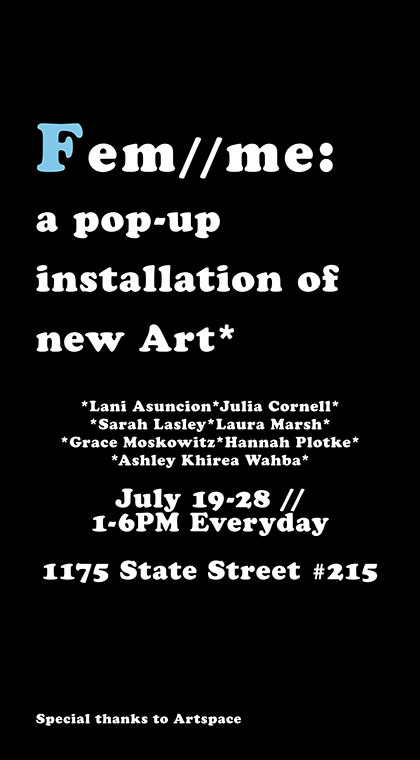 Exhibited is collage and sculpture by Laura Marsh, video by Sarah Lasley, assemblage and jewelry by Ashley Khirea Wahba, paintings by Hannah Plotke, sculptural video relics by Lani Asuncion, artist’s books by Grace Moskowitz, and a multimedia installation by Julia Cornell. The concept for Fem//me was inspired both by the 50th anniversary of Betty Friedan’s The Feminine Mystique, and famed performance artist Marina Abramovic’s denouncement of feminism earlier this year. Located at 1175 State Street, Suite 215, in the former Robby Len swimsuit building, Fem//me opens on Friday July 19. Fem//me is open to the public from 1-6 PM daily through July 28. There is no admission fee. Donations are gratefully accepted. All are welcome. The organizers would like to extend a special thanks to Artspace for their support and the use of their Flatfile.